Launching from the Amazon jungle into the void of space Friday, a Russian Soyuz rocket inaugurated a new launch base and kicked off assembly of a $7.3 billion fleet of navigation satellites, fulfilling a decade of tough diplomatic negotiations and back-breaking construction in the granite bedrock of French Guiana. 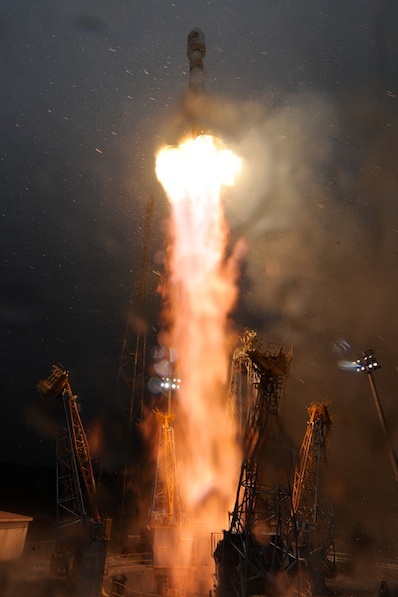 With orange flames spewing from 32 rocket engine nozzles, the 151-foot-tall Soyuz 2-1b rocket swiftly rose from the launch pad in a rain shower at 1030 GMT (6:30 a.m. EDT; 7:30 a.m. local time). The kerosene-burning Soyuz jettisoned four strap-on boosters less than two minutes after liftoff, leaving the empty rockets to fall in the Atlantic Ocean. Flying with a modernized digital control system, the Soyuz core stage and third stage accelerated the rocket to nearly orbital velocity in approximately nine minutes. The rocket's Fregat-MT upper stage, modified to carry extra propellant, ignited for 13 minutes to propel the mission's payloads into an oval-shaped transfer orbit. Another Fregat engine firing three hours later delivered two 1,543-pound Galileo satellites into a circular orbit about 14,400 miles above Earth. A few minutes later, the spacecraft were released from a specially-built dispenser to begin their missions. A European Space Agency spokesperson confirmed both satellites were functioning and had deployed their solar panels. "This launch represents a lot for Europe: we have placed in orbit the first two satellites of Galileo, a system that will position our continent as a world-class player in the strategic domain of satellite navigation, a domain with huge economic perspectives," said Jean-Jacques Dordain, ESA's director general. "Moreover, this historic first launch of a genuine European system like Galileo was performed by the legendary Russian launcher that was used for Sputnik and Yuri Gagarin, a launcher that will, from now on, lift off from Europe's spaceport," Dordain said. The Galileo satellites will conduct maneuvers every 12 hours, alternating between each spacecraft, for the next two weeks to reach their test positions. Three months from launch, controllers will finish their testing of the spacecraft and the satellites will produce their first navigation signals, according to Claude Audouy, operations director at the CNES, or French space agency, control center in Toulouse. The French control center and the European Space Operations Center in Darmstadt, Germany, will oversee the early maneuvers and testing of the Galileo satellites, then control will be handed to routine operations center managed by the German Aerospace Center near Munich. Control of the Galileo navigation payloads on-board each satellite will be managed from Fucino, Italy. Officially dubbed Galileo IOV, the first phase of the European Union's Galileo navigation program is charged with verifying the satellites and navigation instruments work. Once that's complete, the IOV satellites will be transitioned into the operational fleet, which will ultimately reach 30 spacecraft. "IOV means validation in orbit," said Didier Faivre, ESA's director of navigation. "Why validation in orbit? Well, because before we deploy an entire constellation we want to check it out with a mini-constellation." Two more IOV satellites will be launched by the Soyuz rocket next summer, then 14 more operational satellites are on contract with OHB System AG of Bremen, Germany. A team of expatriated Russian engineers working under French oversight prepared the Soyuz rocket for launch from French Guiana, a remote French territory sandwiched between Brazil and Suriname. The launch was doubly important for Europe, which hopes to exploit the Soyuz for commercial and institutional missions. For communications satellites bound for geosynchronous orbit, launching the Soyuz from French Guiana almost doubles its performance over flights from the Baikonur Cosmodrome in Kazakhstan. That's because the Guiana Space Center lies at about 5 degrees north latitude, taking advantage of Earth's faster spin near the equator. The Baikonur Cosmodrome is at 46 degrees north latitude. Launching from the Guiana Space Center also gives Europe more control over the Soyuz program, although Russian contractors and the Russian space agency still control launch operations and direct assembly of the rocket. The Guiana Space Center, known by its French acronym CSG, is funded by the European Space Agency and CNES, the French national space agency. 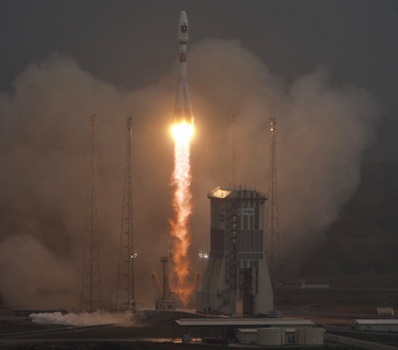 The crucial payload bolted atop the Soyuz rocket was the other source of Europe's interest. The launcher delivered the first two operational satellites of the European Union's Galileo navigation program into orbit more than 14,000 miles above Earth. Now estimated to cost $7.2 billion to complete, the Galileo program has a frustratingly long list of delays and cost overruns, but the constellation is finally on the verge of reality. Built by Thales Alenia Space of Italy, the 1,543-pound satellites are called in-orbit validation platforms. Two more identical spacecraft will be lofted next year on another Soyuz rocket to help verify the navigation instruments aboard the satellites. EADS Astrium of Germany holds overall responsibility for the satellites, but Thales was tapped to assemble the spacecraft in Italy. "Their platform is simple, but their payload is highly sophisticated," Faivre said. The payload includes ultra-precise atomic and rubidium clocks accurate to within one second over three million years. 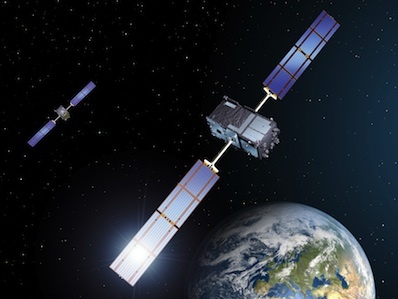 The construction of 14 additional satellites, called full operational capability spacecraft, has been authorized by the European Commission, the EU's executive branch. Antonio Tajani, the European Commission's vice president for industry and entrepreneurship, said a tender for between six and eight more Galileo satellites will reach a conclusion Feb. 1, when a winning contractor will be announced. ESA acts as prime contractor for the Galileo program on behalf of the European Commission.